Objective: Natural orifice transluminal endoscopic surgery has potential benefits for patients and clinicians. Many improved tools have been developed in the last few years, but access, navigation and orientation, especially in the upper abdomen for procedures such as diaphragmatic pacing and Nissen fundoplication, remain an unsolved challenge. NeoGuide has developed a computer-controlled multi-segmented endoscope with the potential for improved navigation and stability during NOTES procedures. The actively controlled segments proximal to the clinican-steered tip follow a path created by the tip in a way that may enable the scope to rise to the anterior abdominal wall and pan down to provide a bird’s eye view of the peritoneum that is familiar in laparoscopy. 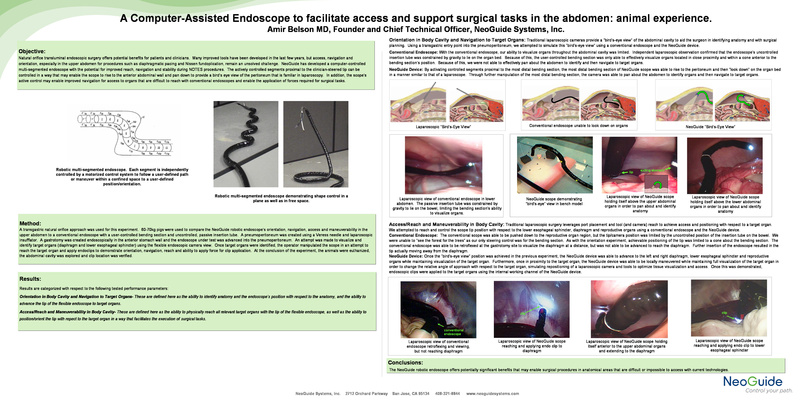 In addition, the scope’s active control may enable improved navigation for access to organs that are difficult to reach with conventional endoscopes and enable the application of forces required for surgical tasks. Method: 60-70kg pigs were used to compare the NeoGuide navigation ability in the upper abdomen to a standard endoscope. Once the scope was introduced into the peritoneum, the target organs (diaphragm and lower esophageal sphincter) were identified using the endoscopic view and the operator manipulated the scope to attempt to reach and apply endoclips to the target organs in the upper abdomen. Results: Using a conventional endoscope, retroflection of the tip in the peritoneum allowed distant visualization of the target organs, but advancing the scope resulted in the scope tip moving away from rather than towards the target organs in the upper abdomen. With the NeoGuide scope, the target organs were readily visualized, and further advancement of the scope resulted in the proximal segments articulating and following the path of the tip to allow the scope to quickly reach and touch the target organ. Endoclips were applied to the target organs using the scope’s working channel. A bird’s eye view was achieved, allowing the active scope to pan about the pneumoperitoneum. The animals were euthanized and the peritoneum was explored and clip location was verified. Conclusions: The NeoGuide computer-assisted endoscope offers potentially significant benefits that may enable surgical procedures in anatomical areas that are difficult or impossible to access with current technologies.